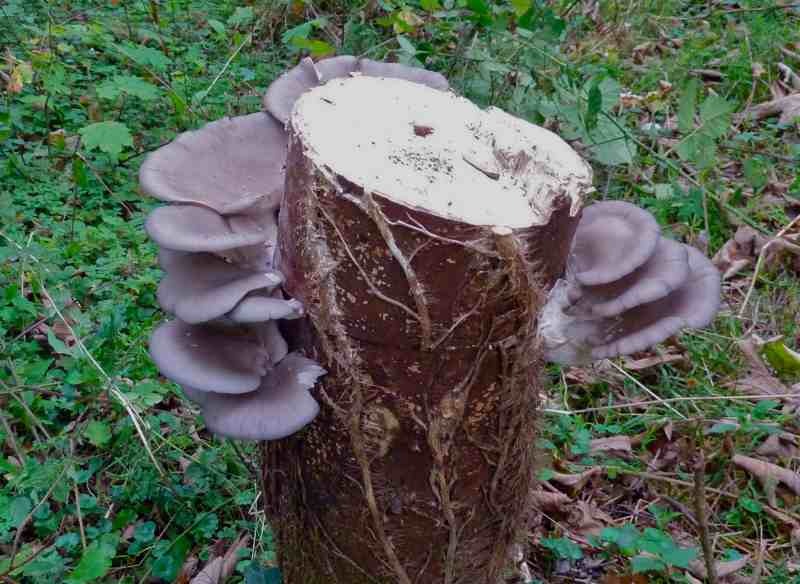 I promised a mushroom recipe last blog and, as if to order, our sycamore stumps have given us first fruit, over a kilo (2 lbs) of oyster mushrooms. In addition, our six-year-old neighbour Camille has been excitedly keeping us up to date with fungal developments on the field that adjoins her garden, a reliable source of field, fairy ring and parasol mushrooms (lucky us!) The thing is: what to do with them all. Frying them in butter and serving them on a slice of toast is always delicious but I wanted to explore other possibilities. What better guide than Jane Grigson’s The Mushroom Feast with over 250 recipes? And what better person to buy me the book than my vegetarian stepdaughter, Christina? all the more fun as she’s not actually that keen on mushrooms. The book was bought as a challenge to see if I could convince her that mushrooms can be palatable, perhaps even tasty. With cultivated oyster mushrooms and a handful of field mushrooms at my disposal, I poured a glass of vin blanc as aperitif and perused Grigson’s book. You’ll need some chopped onion, butter and oil, chopped bacon/lardons, chopped tomatoes, sliced mushrooms, a beaten egg, salt and cayenne pepper. Brown the onion in butter, then add the bacon, toms and mushrooms. Once well cooked, liquidise. Mix in the egg and cook over a low heat until the mixture thickens (don’t let it boil). Season with salt and cayenne, tasting as you go. Spread generously on a slice of toast, or slice a baguette on the slant and dob a bit on each piece. Somewhat overwhelmed with the amount we produced, Gabrielle has also used it as a layer in the vegetarian lasagne we’re going to eat tonight. 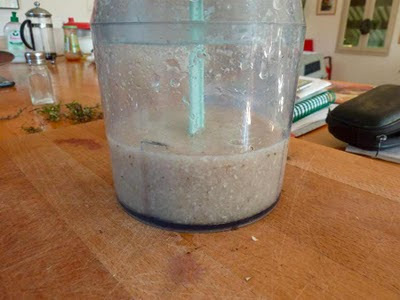 In the hope of encouraging edible mushrooms, I’ve been collecting both field and parasol mushrooms and them chopping up and liquidising them with some water, then pouring this around the smallholding. (Just use one type of mushroom at each attempt). It’ll be a while but I’ll tell you if it works. Photos top to bottom: fungus as food, oyster mushrooms cultivated on a sycamore stump, a baby, then adult, then chopped, then liquidised parasol mushroom. 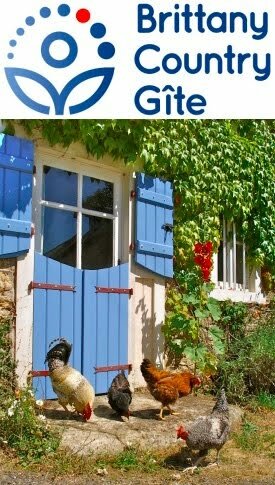 Soon … more recipes with a porky vindaloo and the tale of a long day when everything went wrong for poor Bruno and Mélanie when trying to install their green roof. 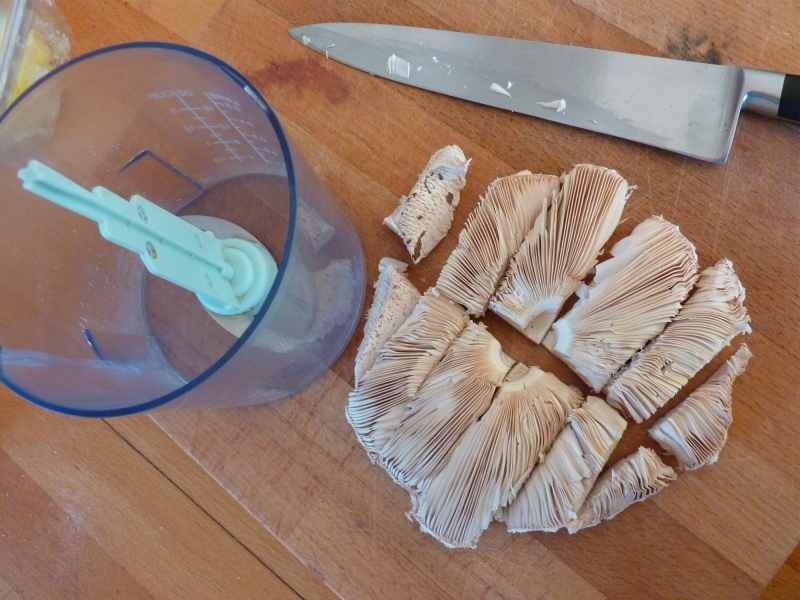 Stuart, a better way of spreading your saved mushrooms is to let them drop their spores onto a slice of kitchen towel. 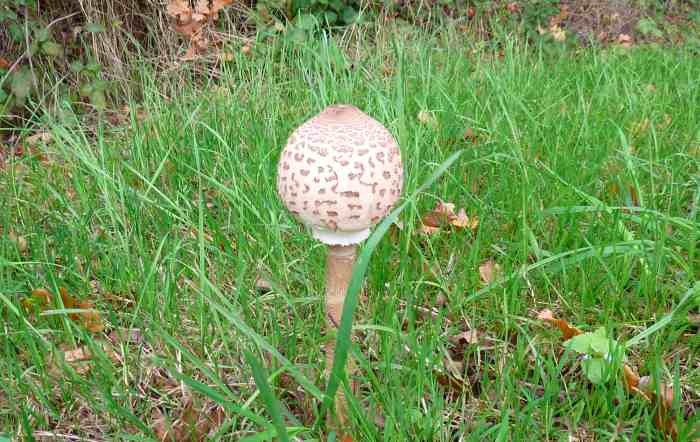 Cut up the resultant ring into small bits and shallow bury those in favourable habitats [use the guide books to suggest habitat]... some like Shaggy Inkcap liquify and the resulting ink can be watered down a bit and poured on the ground... I've done this with them on our verger... just waiting to see if we get any next year [they take at least two years to come from spores]... good luck! That sounds lovely. 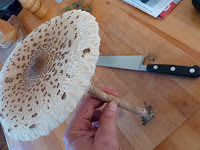 I am actually a big mushroom fan now - having followed the theory that is you try something enough times your taste buds get used to it an eventually you will like it. 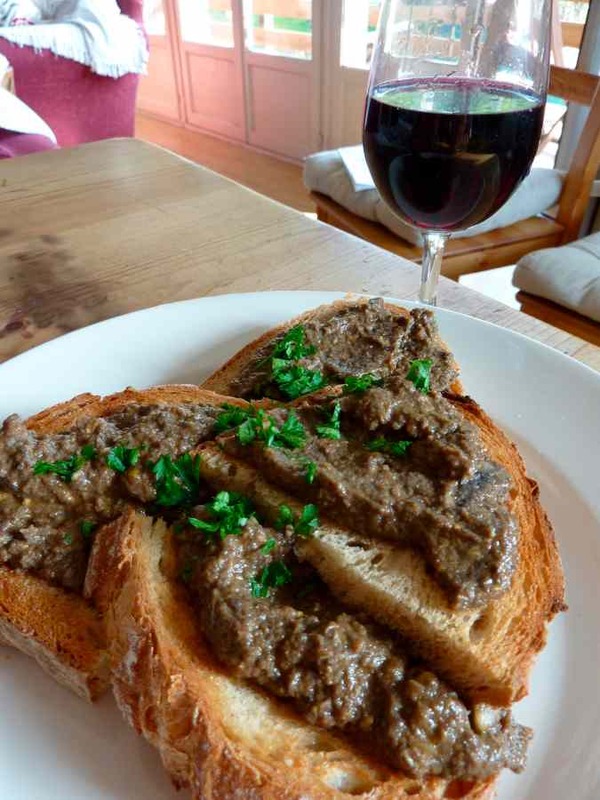 I might try to make the pate - but without the bacon. What do you think would make a good subsitute? I often add capers to anything requiring bacon or anchovies as they give a good saltyness. Thanks for the tip, Tim, I shall try that. Paul Stamets, in Mycelium Running suggests a multi-pronged approach, so I'm always interested to learn of other methods. Good news on the mushroom eating, Christina. 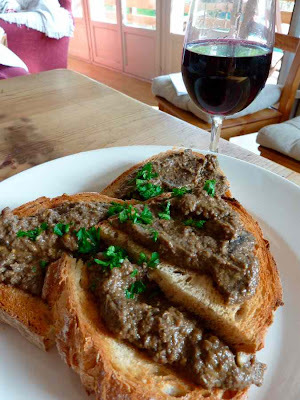 Do try capers and let me know what you think. We have also made a great mushroom soup with our cultivated oyster mushrooms, which includes a generous slop of Madeira wine, yum! There won't be any wild mushrooms when you come over at Christinamus, so if we're not already too late, I'll try to make up something and freeze it for you.